The advertising cost calculator is what you need before jumping into online advertising campaign of any sought. Unfortunately, many business owners and companies struggle with it. 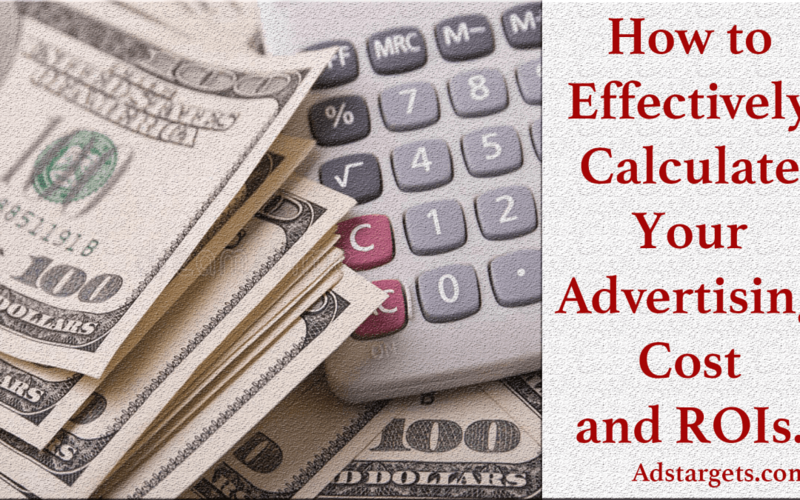 Understanding how to calculate your advertising cost will determine how much you need to spend on a particular campaign and the profit that will come with those Ads. The benefits that come with effective advertising cost calculation are many and determine how much you need to spend to break even point on your yearly advertising budget. In this post, we are going to discuss all the strategies you need to effectively determine your advertising cost and your advertising ROI from each of your advertising campaigns. having said that, let’s jump into it. First, we are going to start with the basic definitions of the key terms to make things easy for you to understand. What is advertising cost calculator? An advertising cost calculator is a simple tool that helps both individuals and businesses to calculate their actual advertising cost for a certain fiscal year in order to determine how much money they have actually spent or will spend on subsequent advertising campaigns. These tools are also capable of making projections on the possible ROI which most consider as the profit from those advertising campaigns. In addition, when calculating advertising cost, one must take into consideration the following. The final results of these projections will be summarized into the number of clicks, the number leads, the actual cost of CPC and CPM, the click-through rates (CTRs) etc. Those projections will help a business systematically enhance their advertising strategy. In the most simple terms, we define cost as the total monetary value or the amount of money expended to acquire goods or services. In business, costs are assigned to various goods and services acquired by a business over time to determine the true value of those products and their expected value or depreciation over a period of time. consequently, we define the advertising cost here as..
Advertising cost is the amount of money a business or an individual spent on advertising campaigns over a period of time. For instance, a particular business may assign or budget $5,000 for Facebook advertising, $6,000 for Google Advertising and maybe $3,000 for TV and Radio advertising all in a one-year advertising budget. Summing all that up will give you the total amount the company is willing to spend on advertising in that fiscal year which will be as follows ($5,000 + $6,000 + $3,000 = $14,000). Now, $14,000 here is considered the advertising cost the company is willing to invest in advertising in one year. Wikipedia defined Return on investment (ROI) as the ratio between the net profit and cost of investment resulting from an investment of some resources. In other words, ROI is basically Return On Investment. The makes Advertising ROI the return on investment of the money spend on advertising. 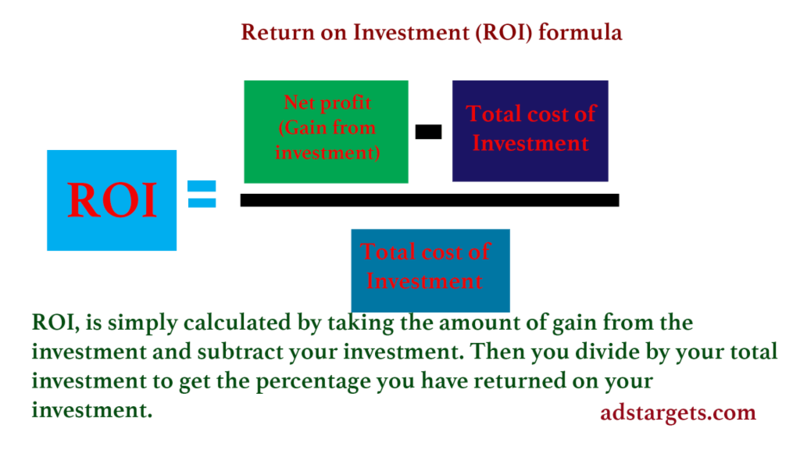 Even though you may see or hear of ROI many times but it simply means “what you get from an investment” It may be seen by many as the profit derived from a particular investment while others may see it as the net profit you get after deducting the total amount of the investment cost in a particular project or an advertising. There is one formula used in calculating return on investment mostly everywhere. This is because ROI is an internationally recognized and used indicator to evaluate the gain on investment both in small and big businesses. To some extent let’s say investment projects are declared successful only when their ROI is evaluated and determined. So now you know the basic formula to calculate ROI. we will now proceed to show you how you can actually calculate your ROI on advertising. Using the same figures we used previously, ($5,000 + $6,000 + $3,000 = $14,000). We can calculate this in a simple way to determine the actual Return on Investment of the $14,000. Since we don’t have the net profit along with the $14,000 advertising cost, we can only assume that after spending $14,000, We gain $67,000 in revenue. The $67,000 gained from advertising on the various forum was able to increase our revenue by $67,000. Now having this figure, we calculate the advertising ROI as follows. First, we say $67,000 – $14,000 = $53,000 which now becomes our Net profit. Now let’s take the Net profit of $53,000 / $14,000 * %100 = %378.571 ROI. In this case, our ROI is %378.571. 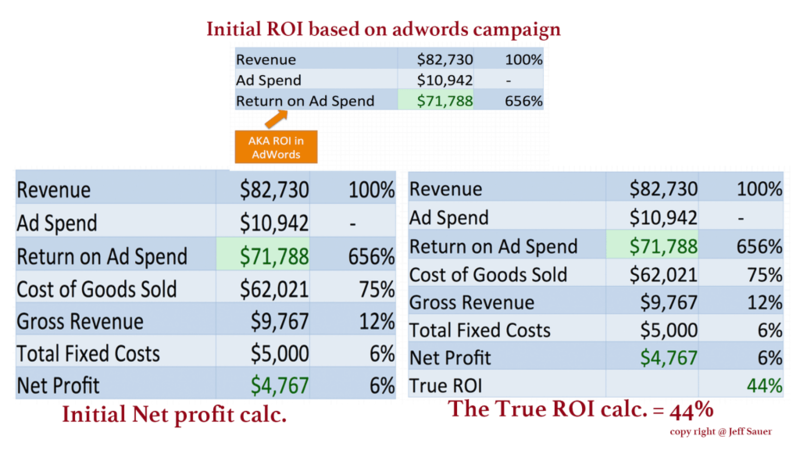 This is how most online advertising campaigns ROI is calculated. Start profitable advertising with us today!! Join now and get $5 for every $35 you deposit! Now I believe you have a full understanding of ROI and calculating ROI. The most important thing you need to know is that when it comes to advertising in the business perspective, we calculate things a bit different from the business perspective to truly arrive at the cost of advertising and the true advertising ROI. This simply means that we have to consider other costs involved such as the cost of goods sold, our fixed cost and deduct that from the initial ROI. Calculating ROI on CPC campaigns is simple but first, you need to determine the cost of the CPC. In this case, let’s say you agree to pay $0.50 per each click on your Google or Facebook Ads, On that particular campaign you end up have about 2,000 clicks for the entire campaign of one week. Now, you will simply have to multiply $0.50 by 2,000 which will give you $1000. $1,000 here is the cost of this particular CPC campaign. So, after spending $1,000 running your campaign, you were able to make sales worth $10,000 within that week. Having these figures will make things easy for you to determine the ROI of this CPC campaign and this is how you will get that. First, Input the revenue generated during the campaign which is $10,000, deduct the cost of running the Ad which is $2,000 and you will arrive at $8,000. Now, in many cases, some marketers will consider $8,000 as the ROI on this campaign. However, In the business world, you are far from the true ROI. The true ROI of this campaign will be calculated by taking the $8,000 which is the net profit and deduct the cost $2,000 and then dividing by the initial cost of the CPC ad which is $2,000. The answer here is always expressed in percent as you will have to multiply your answer by %100. Using simple Advertising cost calculator will help you calculate CPM ROI. The application of the same method and formula applied in the CPC above. The difference is that CPM ads costs are based on 1000 impressions or 1000 views per the agreed amount. It might be that you agreed to pay $5 per every 1000 impressions or views during the advertising campaign. So, if you end up getting 200,000 impressions per one-week ad campaign, you will have to multiply 200,000 impressions by $5 which will give you the cost of $1,000. Take into account that $5 is for every 1000 impressions or views. Understand how to calculate that will enable you to apply the above formula and determine your true ROI on your CPM campaign. Many marketers use online advertising cost calculators to determine their profit from advertising. However, many of those Advertising cost calculators have very basic formulas that only subtract the cost of advertising from the revenue generated during those Ads. This method does not give an accurate representation of the situation. It only shows the net profit derived from that Ad campaign. The best way to determine the profit generated from a particular advertising campaign would be to consider all the cost associated with the ad campaign. Costs such as the cost of goods sold, fixed cost, cost of service rendered, the cost of advertising agencies if any etc. All these costs need to be deducted from the net profit generated from the Ad campaigns. Using the above ROI formula will help a long way in determining the actual cost profit and ROI on advertising campaigns. Most companies advertise to increase their profit margin, However, very often you found out that is not the case, even though some advertise for exposure, the long-term goal is to attract customers and expand their sales in order to increase their revenue and profit. Now that you understand how important profit is to advertising, how do you profit from advertising should be the main focus of your advertising? Below we outline a few but effective tips you need to profit from your advertising. The above-listed tips will reduce unnecessary cost and deliver your ads to only your potential customers. This will increase your conversion rate, increase your sales and ultimately your profit. See some more tips in the video below. Advertising can be potentially profitable for businesses if only it’s done right. The profitability is determined only when the true ROI is known. We encourage all advertisers to take this serious and always make sure they calculate their advertising ROI before carrying on with their Advertising campaigns. If you have other tips on how to improve advertising profits, please let us know in the comment section of this post.